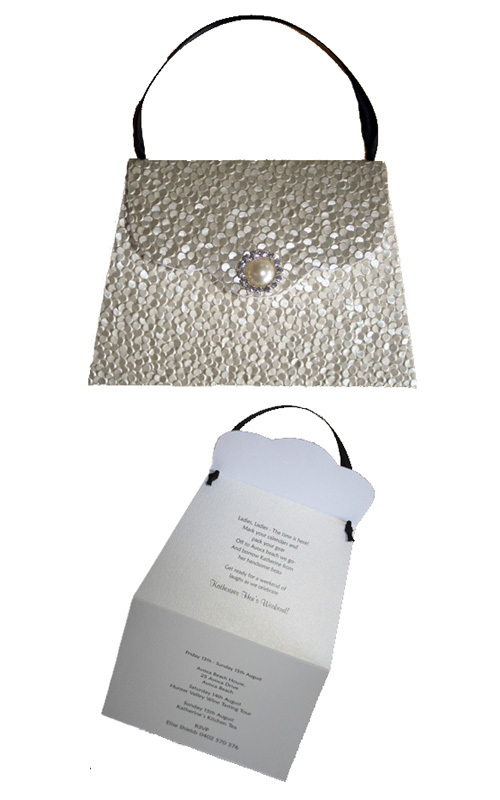 Make your next event a glamorous one with our exclusive Glamour Handbag invitation. Perfect as a Bridal Shower invitation, Hen's night invitation or a special birthday invitatation. Created with the gorgeous Ivory Metallic Pebble Indian Cotton Paper, it features a Diamante and Pearl Cluster with A grade Czech Diamantes, and a Black double sided satin Ribbon handle. Fits inside a C6 sized envelope. The price includes your guests names individually printed on the invitations, and a matching envelope with your guests addresses printed on them. The hand bag also comes in a wide variety of papers. If the colour you like isn't shown on our website, contact us and we will design one especially for you.